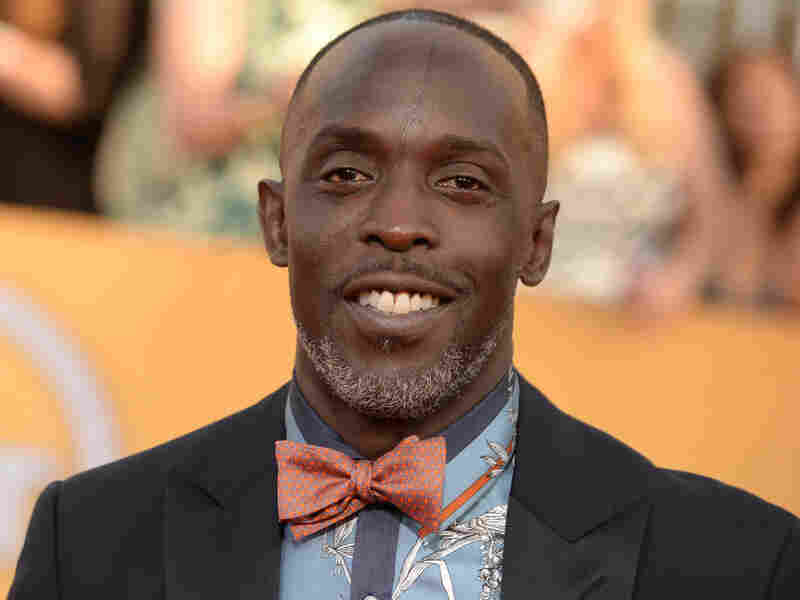 From Backup Dancer To 'The Wire': How A Scar Transformed A Career Before Michael K. Williams played Omar Little on HBO's The Wire, he was a dancer in music videos starring artists like Madonna. Then a barroom brawl changed everything. Michael K. Williams arrives at the 20th annual Screen Actors Guild Awards at the Shrine Auditorium in Los Angeles. As part of a series called "My Big Break," All Things Considered is collecting stories of triumph, big and small. These are the moments when everything seems to click, and people leap forward into their careers. Before Michael Kenneth Williams played Chalky White on HBO's Boardwalk Empire and the infamous Baltimore stickup man Omar Little on The Wire, he was a dancer. He appeared in music videos starring artists like Madonna and George Michael. Then, on his 25th birthday, everything changed. "There was a popping party going on in Queens," Williams says. "I went outside to get some air, and I saw that two of my other friends were being surrounded by some dudes I didn't know." Thinking his friends were about to get jumped, Williams told them it was time to go home. That's when someone else approached Williams from behind. "The dude wiped his hand across his mouth and ... smacked me," he says. "What he did was he spit a razor. He was positioning the razor in his mouth to get it between his middle finger and ring finger. And then he swiped me down my face." That cut would leave a permanent scar. "We managed to escape with our lives, barely, that night," he says. After the attack, Williams' career took a different turn. Directors didn't want him to just dance in videos — they wanted him to act out thug roles. "They were like, 'Mike, roll these dice in this video! Have this fight in this video!' I was like, 'All right!' " Williams remembers. He was making a name for himself. Then Tupac Shakur and Mickey Rourke were filming a movie in New York called Bullet. The production office happened to have a Polaroid picture of Williams, and Tupac himself selected Williams for the role of his little brother. "I think he saw my pain, my struggle, my heart," Williams says. "I was starstruck. I was like, 'Wow, this is Tupac Shakur.' "
After filming Bullet, Williams booked roles on Law and Order and The Sopranos. "I got a little high on the horse," he says. " 'I ain't going to LA, LA is going to send for me. My phone will be ringing any minute now.' "
But that never happened. Williams saw his acting career slipping away. "I was down in the dumps. I got really depressed," he says. "Like, really depressed." Then, months later, Williams received an unexpected fax outlining a character in a new show called The Wire. It was the part for Omar Little. "I got to grow with an amazing group of people that I consider my Wire family," Williams says. "That character changed my life. And that was my big break."